As climate change continues to erode seasonal ice coverage in the Arctic, access through the Northwest Passage continues to expand, opening up greater possibilities for scientific exploration and international trade. With just two aging icebreaker vessels currently capable of navigating this expanding frontier (compared with Russia’s fleet of 41 icebreaking ships), the U.S. Coast Guard has made continued pleas to Congress to appropriate adequate funds to build a new heavy polar ship and expand America’s polar icebreaker fleet. 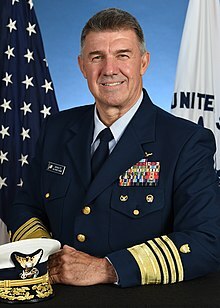 On Thursday, December 6, Admiral Karl L. Schultz, the 26th Commandant of the United States Coast Guard, will deliver an address on the importance of stepping up America’s presence in the Arctic as a measure of national security at a National Press Cub Headliners Luncheon. Admiral Schultz assumed the role of Commandant on June 1, 2018, having previously served as Commander of the Atlantic Area where he was the operational commander for all Coast Guard missions spanning five Coast Guard Districts and 40 states. The Coast Guard is the principal Federal agency responsible for maritime safety, security, and environmental stewardship in U.S. ports and waterways. In this capacity, the Coast Guard protects and defends more than 100,000 miles of U.S. coastline and inland waterways, and safeguards an Exclusive Economic Zone (EEZ) encompassing 4.5 million square miles stretching from North of the Arctic Circle to South of the equator, from Puerto Rico to Guam, encompassing nine time zones – the largest EEZ in the world.